Black is the night, full of fright you will be missing the day… and you will scream- on Halloween!!! 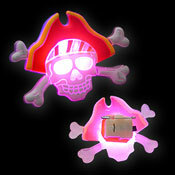 1 bright flashing red LED in each tie blasts away the darkness and all the evil ghosts. And on top of it, it is still a great joke at every Halloween- Party. Incl. 3 X AG3 batteries. 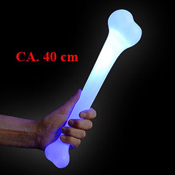 Big bone, about 40 cm, made of plastic. With lamp and flashing function. In red, green and blue.